Nepal's mountainous terrain isn't an obvious destination for those seeking a leisurely cycle trip, but the lowlands of the Terai offer just that along with a rich religious heritage of Buddhism and Hinduism, medieval towns, quaint hillside villages and protected wildlife. We climb out of the Kathmandu Valley and start our riding through shady pine forests with stops along the way at remote temples and learn about the various kingdoms that comprised Nepal. We cycle down to the tropical lowlands where the fertile rice fields are still attended to using traditional farming traditions. We spend a rest day on a canoe and explore the wildlife at Chitwan National Park before continuing on to the sacred birthplace of the Lord Buddha. A visit to the Newari city of Tansen will provide cool climes before we again descend to Pokhara, the base for trekkers on the Annapurna circuit. After a ride around the lakes of this region we'll have a spectacular flight back to Kathmandu. A cycling holiday in Nepal is the ideal way to discover this beautiful and diverse country. The scenery is ever changing on this relaxing ride through the lowlands where you'll meet friendly villagers and have plenty of time to take photos. We also take time out for some gentle hikes, including one where we'll meet our bikes for a exhilarating descent. After airport pickup and hotel check-in, we meet for a trip briefing, bike fitting, and then a welcome dinner. Transfer to our start at Humane Banjyang to cycle to Kulekhani Dam. We continue on the Tribhuvan Highway up to our highest point of the day at 2,320 m.
We hike up an easy trail to a spectacular view of the valley from an old Tibetan monastery. We descend through pine forests to Hetauda, in the Terai, Nepal’s lowlands. We drive to Lothar Bridge to start our off-road riding on a jeep track through a shady forest, following the Rapti River. We cycle to the quaint village of Saurah, before arriving at our relaxing resort on the edge of Chitwan National Park. Today we spend the day at Chitwan National Park. We'll leave the bikes behind as they aren't allowed and explore the reserve from water level on a canoe safari. A full day of activities. We start by cycling to the Tikauli forest, continuing on the paved Mehendra Highway, and breaking for a picnic lunch. We transfer to Lumbini, the birthplace of the Lord Buddha. We ride through rural Nepal with glimpses of village life in the Terai low-lands. Then we meet the Mahendra Highway again and have lunch at Butwal, before reaching Tansen known for its traditional architecture and sweeping views of the Himalayas. We ride from our hotel through the old alleyways of Tansen to an exhilarating descent down to the Siddartha Highway. We have a gentle climb up to Galyang, followed by a two-hour drive to Pokhara. We drive to Begnas Lake to hike to our bikes. Then we ride downhill, fol-lowing the road through to Pokhara old town and directly back to the hotel. We depart serene Pokhara to return to bustling Kathmandu. We fly in the morning and have the afternoon free before our farewell dinner. Day free until airport transfer. Day 2 - Kathmandu – Daman Ride 63km. +2,337m / -1,381m. A wonderful experience with wonderful people. The guides (Putnam, Anoj, and our safe and trusted driver Kaji) were excellent and the experience was incredible! It was the trip of a lifetime. Our guides made it all work seamlessly! We had wonderful cycling, great food and beautiful scenery along the way. Just to tell you again how wonderful our guides were from Purna to Cagi to Nos (spelling).... all were great! We ride more than 310 km in seven cycling days. This tour is mainly on road with a few sections off-road on jeep-width dirt tracks. The distances are not too strenuous, and there are many downhills to look forward to. We designed the route for those who wish to see the rural countryside and absorb the rich history of Nepal, all while enjoying an active holiday. We have a few climbs on the first day as we leave the Kathmandu Valley. Once we descend into the lowlands, the riding is on flat terrain, and we do not see many hills of any significance. Suitability: You can expect a fairly gentle ride each day with none of the distances being overly long. There are a few small hills and some dirt trails, but these can be tackled by anyone with a moderate level of fitness. 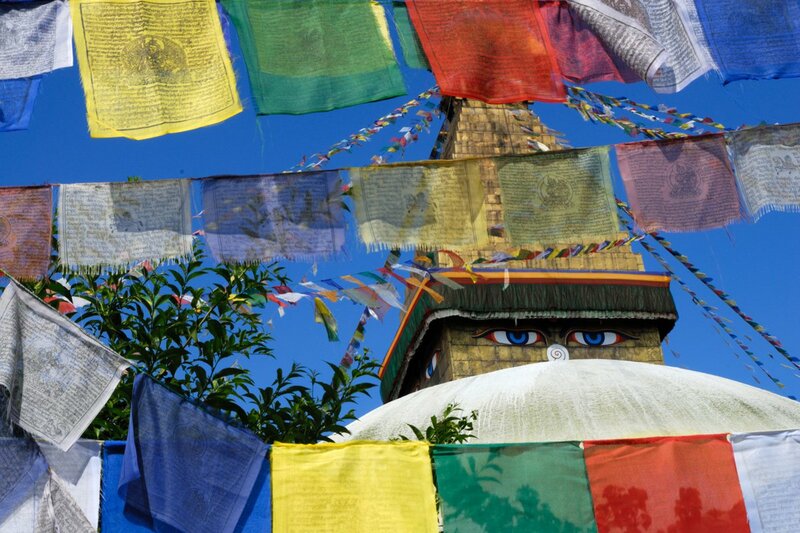 The emphasis on this tour is Nepal’s history, culture, and scenery, all off the beaten track. Biking Conditions: This trip is mainly on tarmac roads with a few days where we will have hard packed dirt trails – no off-road experience required. An air-conditioned support bus travels behind the group to supports us, and participants can cycle as much or as little as they like and still enjoy the same views as the rest of the group. 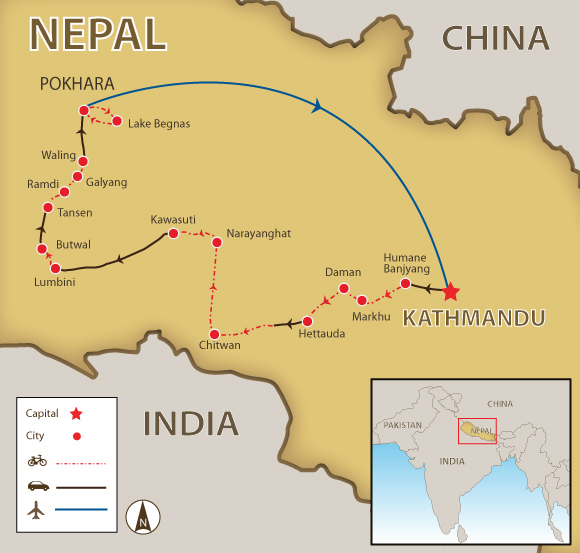 This tour starts in Kathmandu, where you will be picked up at the airport and transferred to your hotel. There, we will have a trip briefing and bike fitting, followed by a welcome dinner. We transfer to the start of our ride at Humane Banjyang. From here, we ride through lush pine forests and through villages, with a climb up to the rim of Kulekhani Dam. We then continue riding on dirt trails to Marku, where we break for lunch overlooking a clear lake. We continue on the Tribhuvan Highway up to our highest point of the day: 2,320 m at the village of Daman. Here we'll have a panoramic view of the Himalayas, with Everest in the east on a clear day. This morning, we hike up an easy trail to a spectacular view of the valley from an old Tibetan monastery. After photos, we return to the hotel for lunch. Our afternoon riding will be easy as we descend through pine forests and rhododendrons, the Nepalese national flower, and cycle through small villages and their extensive farmlands. We ride on a backroad south to Hetauda, in the Terai, the lowlands of Nepal. The roads will get busier as we approach the city surrounded by hills and at the confluence of three rivers. After breakfast, we drive to Lothar Bridge to start our off-road riding on a jeep track through a shady forest, following the Rapti River. We cycle to Sauraha, a small and very quaint village of mud and daub huts and houses, and continue through rice paddies with the Himalayan foothills as our backdrop to the north. Most of our ride will be off-road on ox-cart trails, crossing numerous rivers that keep the lowlands fertile as we cycle to our relaxing resort on the edge of Chitwan National Park. Chitwan, Nepal's first national park, was established in 1973 and protects 932 sq km of sal forest, water marshes, and rippling grassland that is home to the endangered one-horned Indian rhino, tigers, leopards, and rare Gangetic dolphins. Today, we leave the bikes behind as they aren't allowed in the park and explore the reserve from water level on a canoe safari. You'll immerse yourself in the wonderful world of nature where you will hear bird songs, the rustle of deer in the bushes, and have a chance of glimpsing some of the most endangered animals on earth. Rise to the peaceful sounds of birds before fuelling up for a full day of activities. We start by cycling to the Tikauli Forest, and for 8 km, we will be in the midst of more than 130 species of flora as we ride on a dirt trail. The landscape shifts to farms and villages once we leave the forest behind. We continue on the paved Mehendra Highway and break for a picnic lunch. We then transfer to Lumbini, the birthplace of the Lord Buddha. The exact spot where Queen Mayadevi gave birth to Siddhartha Gautama, who as the Buddha Gautama founded the Buddhist tradition is marked by a pillar erected by Emperor Asoka in 249 BC. Designated a UNESCO World Heritage Site in 1997, there are numerous temples and the Puskarini, or Holy Pond, where the Buddha's mother took the ritual dip prior to his birth. This morning's ride takes us through rural Nepal, giving us glimpses of village life in the Terai lowlands. We ride through villages where chickens and pigs run free and past fields where water buffaloes are wallowing in the mud. We ride on quiet country roads to meet the Mahendra Highway and have lunch at Butwal. After lunch, we load the bikes for the short, winding drive up to the hill station town of Tansen at 1440 m. This old Newari city is known for its traditional architecture, sweeping views of the Himalayas, and cool temperatures. We ride from our hotel through the old alleyways of Tansen; then we have an exhilarating descent on a winding road that takes us down to the Siddartha Highway. Here the road widens, but the twists and turns continue to the town of Ramdi. The road rises, and there's a gentle climb up to Galyang and lunch. Then we get in our vehicles for a 2-hour drive to Pokhara. Spread along the edge of Phewa Lake, this picturesque town is the starting point for treks in the Annapurna region. If the clouds haven't moved in, there will be stunning views of Machhapuchhare’s peak at 6,997 m and the whole Annapurna range. Pokhara is also known as the “city of seven lakes”, and today we drive to one of them, Begnas Tal, for a hike and a bike ride. From the shores of the lake, we set out on foot for a two-hour trek. Once we ascended, we follow a ridge line with the stunning white peaks of the Annapurna range providing an inspiring backdrop. In Majdana, we will up with the bikes and ride downhill on a dirt track to the Vijayaypur River. We then hit pavement and follow the road through to Pokhara old town and directly back to the hotel. This morning, we depart the serenity of Pokhara to return to the bustle of Kathmandu. Flights are frequently delayed, so we will book ourselves on a morning flight and give ourselves a cushion in case of the unexpected. Keep your cameras with you for the 30-minute flight as we'll have unimpeded views of the snow-covered peaks of the Himalayas. Back in Kathmandu, you have the afternoon free to do some shopping or see more of the many fascinating sights. We meet up in the evening for a farewell dinner. Day free until transfer to airport for your flight. Please make sure that your passport is still valid for at least six months at the end of the tour. All foreigners, except Indians, must have a visa. You can obtain a visa on arrival at the airport by filling out an application form and providing a passport photograph. To get a jump on the line, you can download a visa application form from the websites of the Nepali embassy in Washington, DC or London ahead of time. The Visa fee depends on duration of stay; 15-day visa costs US$25 and 30-day visa costs US$40. Please see further details from Nepali embassy websites. There are no compulsory vaccinations although it is strongly recommended that you are vaccinated against: Typhoid; Hepatitis A and B. Tetanus and polio vaccinations should also be up to date at the time of travel. If you have come from an area infected with yellow fever you are required to be vaccinated before entering the country. Please speak to your doctor/physician for the most recent information. Temperatures and climate vary according to the altitude. Nepal has two seasons – the dry season runs from October to May and the wet (monsoon) season from June to September, when 80% of the rain falls. Nepal’s weather is generally predictable and pleasant with March to May (spring) and September to November (autumn) being the best times to visit. The Kathmandu Valley, at an altitude of 1,310 m/ 4,297 ft, has a mild climate, ranging from 19-27ºC/67-81ºF in summer, and 2-20ºC /36-68ºF in winter. Come prepared for chilly evenings and bring proper gear for brisk early morning starts and descents. In Kathmandu, guests can look forward to staying at the Tibet Hotel. During our route to Pokhara we'll be staying in comfortable hotels and resorts and spend two nights at the centrally located Hotel Landmark in Pokhara. All accommodation described in the itinerary are included in the tour cost. Meals are included in the itinerary as B = breakfast, L = lunch, and D = dinner. Camping meals will be prepared by the cook team and feature Nepali and Western-style cuisine. Any special dietary requirements can also be catered for as well. Please let us know at the time of booking. Keeping you completely hydrated is a job we take very seriously. Cold water and energy-restoring drinks are included in the tour price. Soft drinks and other beverages during meals are not included. Beer and alcohol are NOT included in the price. The currency is the Nepali rupee (Rs) and there are Standard Chartered Bank ATMs in Kathmandu and Pokhara that take international cards. However, to be safe, we suggest you change money in Kathmandu and carry cash as backup in case the power goes down, the ATM is out of order, or you lose or break your plastic. Major credit cards are widely accepted at midrange and better hotels, restaurants and fancy shops in the Kathmandu Valley and Pokhara only.